Lancôme will launch La Vie Est Belle L'Absolu in August. 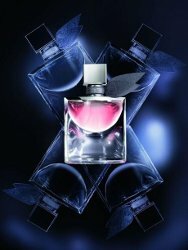 The new fragrance for women is a deeper, more intense variation on 2012's La Vie Est Belle Eau de Parfum (and see also: La Vie Est Belle L’Eau de Parfum Légère, La Vie Est Belle Eau de Toilette). The new version magnifies the original's iris and gourmand notes, and was developed by perfumers Dominique Ropion and Anne Flipo. The notes feature jasmine, orange blossom, rose, cashmeran, praline, pear, blackcurrant and tonka bean. Lancôme La Vie Est Belle L'Absolu will be available in 20 and 40 ml. I didn’t care for the original, and the flanker doesn’t interest me at all. Oh, I had no idea this was so popular. It’s so bland when I sniff it. I do love Magie Noire (pre-reformulation ) and O de Lancôme. But this one doesn’t do a thing for me. Doesn’t do much for me either, but yes, it’s very popular! I smelled it EVERYWHERE when I was in Barcelona in April. It sounds like it is worth a try with the iris and gourmand notes pumped up (maybe more vanilla, but not toothachingly sweet overall). And possibly a bit more floral…they’ve added more floral notes. I’ll give it a shot if I see it. ..I don’t get why it’s so popular..it’s everything I hate about modern scent…on steroids. It stinks up the whole dept. store…I hate it so much. I get mad everytime I smell it. I actually get mad, lol. I wish they all could perish in a huge fire or something. Or go into a huge trash compactor..like that one in Star Wars..when they almost get smashed? And I would be the one at the lever:). Ppl that wear this think anything else is ‘old grandma’…perfumes like this are the reason the classics are fading away…that and stupid restrictions. MAGNIFIES the gourmand notes?! Is that even possible? Kill me. If I see one of these…I will want to throw it on the ground…but then it will only magnify even more. It’s candied Raid. LMAO! Everytime I walk in a department store someone corners me and tries to spray it on me. I think this is like the new Angel for alot of people. Soon to stink up strip clubs everywhere. Actually, I feel exactly the same way about D&G Light Blue. To each his/her own, I guess. I don’t like Blue either! Ditto! There is a new flanker that is even worse. While I personally don’t wear La Vie Est Belle, I don’t find it bad and like you said it’s very popular, for example my mother who hardly wears perfume owns a bottle and that is also why I’m interested in this… I might have her Christmas present bought real early this year. No offense, sorry, and it’s nice to have Christmas knocked out early! Hope your mom likes it. Me too no offense to your mom. While I liked the original version of this, it felt too similar to V&R Flowerbomb so I never actually bought any. Hopefully this take will be different enough that I can justify buying some. And yeah, I’m one of those girls who likes Angel, too, though nothing repells me faster than Light Blue. I never liked that one and talk about another perfume I smell everywhere I go. That’s it Flowerbomb! Nothing wrong with Angel. I wore it for two years. Still have handbags that smell of Angel. I can’t imagine something that is more strong and concentrated than the original (shudder). I received a bottle of this as a gift and was horrified at the smell… I tried it once and then threw it in the back of the closet. I guess it works on a lot of other people but I can’t bear it.